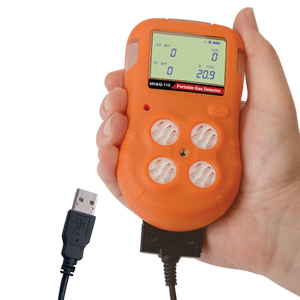 The HHAQ-110 simultaneously detects Methane (CH4), Carbon Monoxide (CO), Oxygen (O2) and Hydrogen Sulfide (H2S) making it the ideal device for detecting gas leaks in mines, chemical plants, refineries and construction tunnels. The HHAQ-110 displays the current level of each gas as well as the STEL (short term exposure limit) and TWA (time weighted average). Concentration alarms are programmable in three modes (audible, visual and vibrating). The catalytic/electrochemical sensor uses natural diffusion sampling (typical sensor life 2 years). The HHAQ-110 is powered by a rechargeable lithium-ion battery and includes the charger. Note: Comes complete with HHAQ-110 meter with built-in Li-ion battery, USB/AC charger, molded case, universal heavy-duty D-Ring alligator clip, belt clip and operator’s manual.